"Are you OK? wrote a friend this week. "Are your blogging days over? Of course there's always the possibility that they locked the storefront, turned off the lights and didn't realize you had fallen asleep under a comforting pile of pristine cups-in-waiting." Locked away with my drawing materials! A lovely thought. But no, I have just been buried beneath all those domestic and mundane things long neglected for the sake of art. And in truth, by the end of six weeks in the window I felt as empty as a used paper coffee cup. 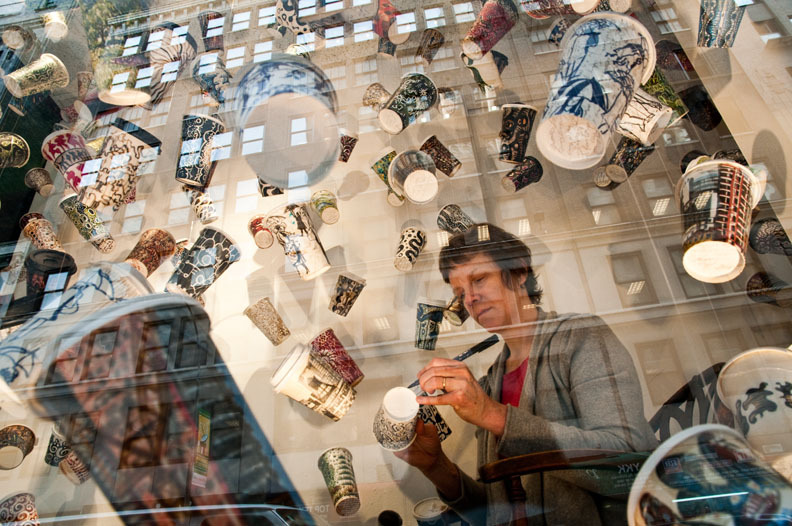 In early April, I packed up cup drawings for collectors, exhibitions and the Cheryl McGinnis Gallery and felt bereft to see the installation dispersed. After that, I continued to pack: for the Trans Art Conference in Boston, to clear space so I could repaint my apartment and for trips to visit family. 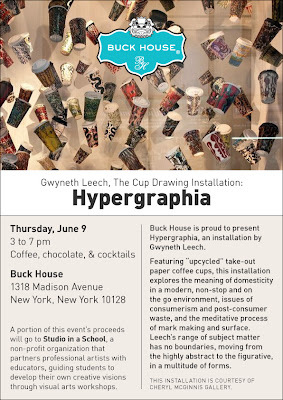 Then a few weeks ago, I found myself on the Upper East side drinking Arnold Palmer's (half lemonade, half ice tea) with Cheryl McGinnis and Deborah Buck at Buck House on Madison Avenue at 94th Street, to plan a second Hypergraphia Cup Drawing Window Installation. This time it will be a one-day-only event. On June 9th I will be drawing in the window and from 3 - 7 PM they will be serving coffees, cocktails and chocolates. So if you missed it on 38th Street, here is a chance to experience Hypergraphia for yourself. Or if you loved it, please bring or send friends. Summer is here and I am refilled with fresh ideas and the energy to tackle that pile of pristine cups-in-waiting! See you at Buck House. Yay! Welcome back! I look forward to your city ramblings while you sip. Wish I could drop by and say hi, have fun on your next window installation! I've been following your installations and wish that I could cross the continent to see you in process on June 9th. I have a love for those paper cups and your drawings on them are wonderful. All the best for a fruitful and fulfilling day. Thanks all! 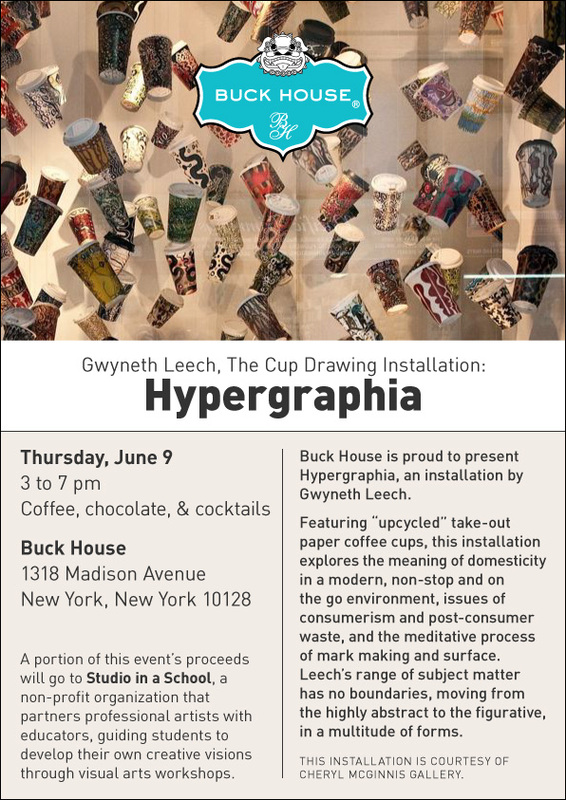 June 9th has dawned and I am heading out the door to Buck House to install 300 cups in tow hours. Report to follow. LOVE what you do. happened in by chance yesterday. Thanks for posting on your blog, Jonatha. It was pleasure to meet you.